The Chronicle’s biweekly column Chicago In the News offers a digest of commentary and quotations by a few of the University faculty members, students and alumni who have been headlining the news in recent weeks. Chicago faculty members are some of the most frequently quoted experts, so space allows publishing references to only selected examples. To read many of the full newspaper articles mentioned in this column, visit the In the News column at the University News Office Web site: http://www-news.uchicago.edu. Olufunmilayo Olopade, Professor in Hematology/Oncology in Medicine, is featured in the October issue of Ebony magazine. Olopade, an international leader in breast cancer research and Director of the Cancer Risk Clinic at the University, discussed her work and her search for better treatments against breast cancer, as well as the disparities of the disease, which can occur in an aggressive form that more often strikes young women of African descent than it does white women. “I didn’t start out to be a doctor who studies disparities, but you cannot be on the South Side of Chicago and not notice disparities. Now that it’s one of the national priorities in health care to eliminate and reduce these disparities, I feel something is happening,” she said. Her dream, Olopade told Ebony, is to find the genes that make breast cancer aggressive in some women and from there develop new treatments. The University’s Consortium on Chicago School Research will be the model for the new Research Partnership for New York City Schools, which will begin its own analysis of that city’s school performance following school reforms there. John Q. Easton, Director of the Consortium on Chicago School Research, was quoted in the Wednesday, Oct. 3 New York Times in a story that carried the report. He noted that including school officials in the research process ensures that the findings will be respected. “Part of what has made us trusted is that we had all the opposing voices together. If they don’t buy into it, it’s not going to be listened to,” he said. Louise Hawkley, Research Associate in the Center for Cognitive and Social Neuroscience and Psychology, was quoted in an article published in the San Antonio News Express Tuesday, Oct. 9. The article described the effects of deep-seated loneliness that some people experience, sometimes over many years without getting therapeutic help. Hawkley, who has studied with John Cacioppo, the Tiffany & Margaret Blake Distinguished Service Professor in Psychology and the College, the physical health effects of deep-seated, chronic loneliness, found that loneliness is linked to physical deterioration and contributes to aging. “The ill effects are cumulative and get worse with age and time,” said Hawkley. Hawkley and Cacioppo’s study found that lonely subjects had higher blood pressure, and their urine samples showed higher levels of epinephrine, a stress hormone that triggers “fight or flight” in people. Paul Sally Jr., Professor in Mathematics and the College, was featured in a Monday, Oct. 1 Boston Globe story, which was published following his visit to the Massachusetts Institute of Technology. The article described Sally’s career as a research mathematician and a beloved teacher. Sally also was the first director of the University of Chicago School Mathematics Project, which developed the Chicago K-6 math education program. He later began a program to teach mathematics teachers better math-teaching skills. “The key at almost every level is knowing enough optional strategies so that if a person doesn’t get it, you have a place to go. 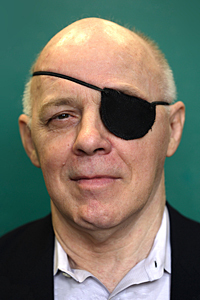 You need to be able to change tracks, to have a dozen different ways to teach the same thing.” The 6-foot, 3-inch Sally, who uses prosthetics after losing both his legs due to complications from Type 1 diabetes and has worn an eye patch since losing his left eye 25 years ago because of the disease, is known around campus as “Professor Pirate.” Although his disease has taken much, it will not keep him from continuing to give to his students. “I’ll keep teaching as long as I can find the blackboard,” he said. The research of John Mearsheimer, the R. Wendell Harrison Distinguished Service Professor in Political Science and the College, and his colleague Stephen Walt of Harvard University, presented in their book, The Israel Lobby and U.S. Foreign Policy, has received widespread media attention for its critical analysis of U.S. foreign policy regarding Israel and Israel’s supporters, which, the two scholars write, make up an Israel lobby that influences policy decisions in the Middle East. According to Mearsheimer and Walt, Israel has become a strategic liability for America.” This claim and their findings to back up their argument have attracted much critical analysis of their work. Stories have appeared in publications across the globe, including the New York Times, The Los Angeles Times, The Jewish Chronicle, The Washington Post, The New Yorker, The Wall Street Journal, The Financial Times of London, The Daily Star, Beirut, Lebanon, The Jordan Times and the New Republic. 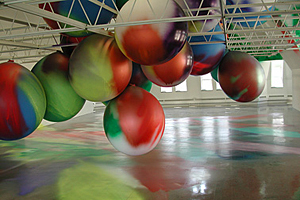 Atoms Inside Balloons, April 29, 2007, is the work of Dusseldorf-based artist Katharina Grosse. It was created in the Renaissance Society’s gallery in Cobb Hall.